Antibodies meant for research, diagnostic and therapeutic purposes require optimal conformational stability. 2bind provides different buffer screening approaches using the novel and innovative nanoDSF technology in order to find optimal conditions for antibodies and other proteins. In this example study, a two-step buffer screening of the monoclonal antibody 1B3B9 (Merck Millipore), which is targeted against ERK2 (MAPK1, mitogen-activated protein kinase 1), is described. By using the high-sensitive precision of the nanoDSF technology, different conditions were analyzed in a short period of time. As a first step, 24 different buffer conditions were tested within 75 min (Figure 1). Figure 1. Melting temperatures of mAB 1B3B9 in 24 different buffers, sorted from the highest to the lowest pH value. The thermal stability of the mAB 1B3B9 was determined along a temperature gradient of 20 °C to 95 °C under different buffer conditions all containing 150 mM NaCl, but differing in buffer substances and pH values. In each buffer condition a single unfolding transition point was detected, meaning one melting temperature (Tm). Figure 1 shows the melting temperatures of the 24 buffer conditions sorted from the highest to the lowest pH value, indicating that the thermal stability of mAB 1B3B9 highly depends on the pH value. Overall, pH values above 6.5 result in a melting temperature between 73.4 °C and 74.3 °C (blue box), whereas pH values below 6.5 result in lower melting temperatures (Tm) down to 67.6 °C. 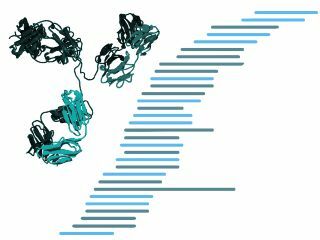 Since additives may have a considerable influence on the stability and function of antibodies, the impact of additives on the conformational stability of the mAB 1B3B9 was tested in a second step. Therefore, two buffers from the first step (HEPES pH 7.4 and Tris-Hcl pH 7.5) were supplemented with different additives (Figure 2). The supplementation of Pluronic F127, Tween-20, EDTA, Sorbitol, Glucose, Sucrose, Glycine, and Trehalose as additivies in HEPES pH 7.4 and Tris-HCl pH 7.5 buffers indicates a change in the melting temperature between + 0.1 °C and + 1 °C, thus in the thermal stability of the mAB 1B3B9. Conclusively, the two step buffer screening approach identified 50 mM HEPES pH 7.4, 150 NaCl, 250 mM Trehalose as an optimal buffer for mAB 1B3B9 in terms of highest melting temperature under low sample consumption. Figure 2. Influence of different buffer additives on the melting temperature of mAB 1B3B9. The 2bind nanoDSF buffer screen is the perfect tool to find optimal buffer conditions for your antibody. Benefit from the fast turnaround, low sample consumption and high precision of our nanoDSF platform.